Malta remains a popular destination for many British sun-seekers who want a few home comforts alongside their Mediterranean breaches. Most visitors head straight to their resort hotels but it can be rewarding to wander the streets of the island’s unusual and atmospheric capital Valletta. Valletta is a disconcerting combination of a medieval fortress, a Venetian Renaissance city and a provincial British town from the 1950s. Impressive palazzos and porticoes can be viewed alongside red phone boxes and greasy spoon cafes. A wander through the shady streets is full of these kinds of contrasts, imposing medieval buildings punctuated with quaint old shops and some rough bars that tended to cater to the tastes of visiting seaman. 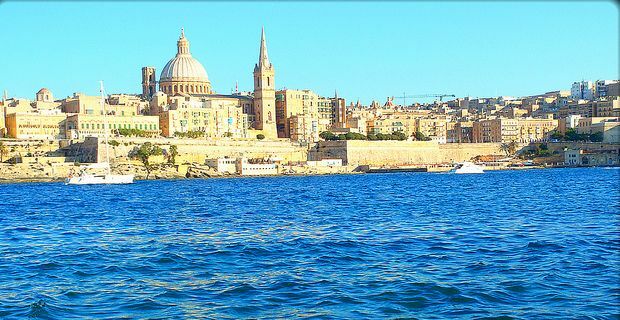 You get a sense of Valletta’s strategic importance as a hub of Mediterranean trade from the sea. There are plenty of harbour cruises on offer, but the thrifty might be inclined to buy a ticket on the cheaper Sliema ferry, which provides much the same views of the city. The ferry trip cruises past the pretty harbour of Marsamxett and around Manoel island. For a longer trip, head out of Valletta’s main gate into the crowded square where the ramshackle 1950s yellow buses that still provide much of Malta’s public transport gather. Take a trip on the number 1, 2, 4 or 6 along the coast to Vittoriosa where the Dghaisa shuttle boats depart regularly back to the capital. The Dghaisa is a typically Maltese combination of Arabic and Venetian influences, half fishing vessel, half gondola. It’s the perfect way to make a romantic approach to Valletta, through stiff Mediterranean breezes and choppy waters. The full drama of the city can be appreciated as the little craft makes its way through the Grand Harbour to the Victoria Gate. Where you are within easy reach of an English afternoon tea with cakes.